“Encyclopedia of the Mad Gardener” takes place in a fictional future where the equatorial line has thickened to become a zone, forcing mass migrations to the ends of the planet. This equatorial zone is the dampscape, where things are irremediably hybrid and contaminated (human/nonhuman, virtual/real, organic/inorganic) and the boundary-edges of solids are fuzzy, mushy, and moist. The zone undecipherable of the equator stands in contrast to the Garden, which is an inhabitable heterotopia, a site of purification, albeit precarious. Desperate for resources in this hollowed-out planet, the Department’s priority is to create a new classification system to determine ‘pure rubbish’, elements from which no further value can be extracted. The narrative focus is on “this Clarice”, who is tasked to draft this taxonomy, but reaches a point of saturation where she herself melts into the humid dampscape. This piece was developed in a writing workshop, Post Super Future Asia, organized by Jason Wee, founder of Grey Projects in Singapore, and Esther Lu, director of Taiwan Contemporary Art Centre. They need to hear its airless breathing, ozone skin and metal spines heaving in and out. Words weigh on this Clarice with their inclusions and exclusions, non-sequiturs and false dichotomies, mistakes lodge themselves into their windpipe, air thinning out. Walking out into the labyrinth has turned into a nightly habit. They need to hear its airless breathing, ozone skin and metal spines heaving in and out. Under the genteel face of the pink moon, the orchids appear to droop slightly, providing no compensation. They are no longer the verdant and beautiful, immortal stalks standing erect and sitting out of time. Only the sweet smell of smouldering plastic and aircon refrigerant, perhaps, already leaking through the pores of the triple-layered glass. They feel the smells seep into their nasal channels, dioxins boiled under the pink moon, flooding neural pathways, gases slowly encrusting, lining the PVC walls of veins and arteries. This Clarice would then become rock, an eternal orchid. Other projects were lighter, more definite, like the implementation of picture-windows onto every edge of the garden, the first of many ingenious contributions by this Clarice for the Department. The message of the picture-windows were simple: look at what’s outside and look at yourself. The outside would be burnished into the day-to-day lives of the garden’s inhabitants, instilling gratitude, and more importantly, keeping the outside within a frame, as an image, an undesirable horizon, to be viewed from a comfortable distance. This project was like slime, neither fluid nor solid, categories sliding past one another, sticking and mixing like weekday adulterers under warm neon. These were words for contaminated things and the boundaries drawn drew no blood. From past experiences, the Department’s campaigns with compounding, hyphenation and other terminological transplants were unviable options. Surgical as they were, these words quickly dissolved into obsolescence. The Department, tired from the Babel-like confusion in the administration of the tropics, placed the renovation of existing classification systems as its top priority. Et cetera was the other problem. The problem was equatorial, a line thickened from a hairline to a stroke to a wet stain: zone undecipherable. Three planets and a fraction already exhausted, causing in a mass migration from the maladies and mercurial weather of the yawning tropics. The Department, tired from the Babel-like confusion in the administration of the tropics, placed the renovation of existing classification systems as its top priority. The most urgent was to delimit pure rubbish, waste for which no value could be extracted. But this Clarice began from nowhere, the agglutinating mush offering neither entry nor exit, fleeing from definition, by definition, this Clarice could not dissect and examine its pieces. It was an admission of defeat. This evening that Clarice, letting their feet navigate the sinews of the labyrinth, find themselves in another pavilion. One could tell that not many have visited the Pavilion of Benevolent Knowledge, with its carbonfibre seats splintered and frayed, the onceluminescent orange of its pillars now off-colour, browned by the moon. Cloaks of dust settled on the miniaturized Banyan. The eyes direct themselves, contouring along the tangents and angles of the pavilion, all lines leading towards the picture window. Towards the outside, an anachronistic dampscape, wetland and swamp. Perhaps from the affliction of the wandering mind, in this sweltering evening, the glass surface of the window saturates itself, as though looking back at this Clarice were the lace of hairline cracks, the undulating light that breaks apart, dappled and dappling layers of dust, rainwater stains, and their reflection onto the uneven glass coming together and torn asunder, one of thousand other countenances sunken into the mush, tangled with gossamer plastic and sewer-lalang floating in deadwater, rafflesian rot blooming with silicon-sand particles of circuitboard, eroded, haunted by the great drift of spectral vibrations from databytes, undeletable. What remains of wet banana leaves, crushed, a halo of flies starving for polyethylene. Marcus Yee is an artist and writer working at the intersections of waste cultures, infrastructure, and new materialism. 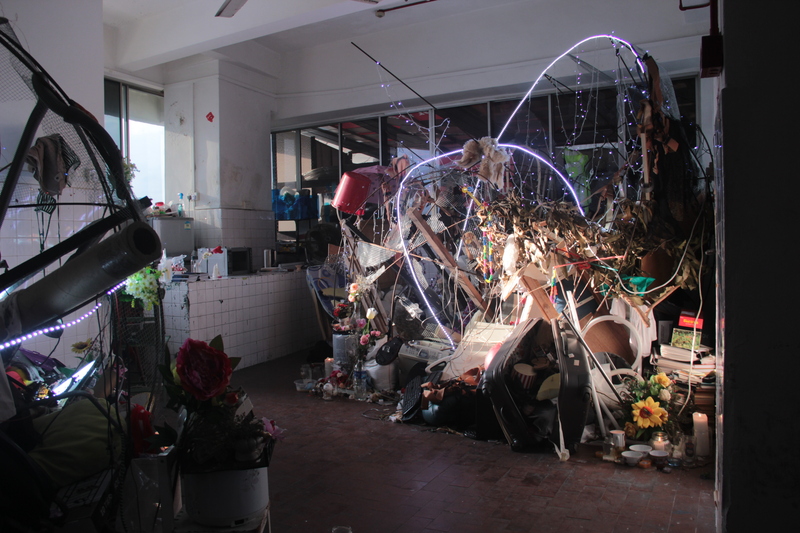 He recently presented his first solo exhibition, Altars for Four Silly Planets in soft/WALL/studs, Singapore.